Protest Obama Visit to Charlotte – Impeach Obama NOW! | Stop Obama Now!! 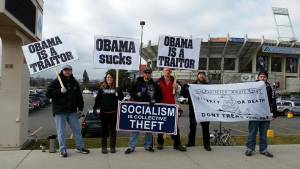 Protest Obama Visit to Charlotte – Impeach Obama NOW! Earlier Impeach Obama NOW protest in Boise, Idaho Dictator Obama will visit Charlotte, NC on Tuesday, April 15 to receive the idolization of his followers at ImaginatiOn in Uptown Charlotte. Local patriot groups and individuals are requested to join this protest. If you belong to a group in the area, please ask your organizer to support this protest. Keep checking this webpage for updates on time and location. Details are tentative, though the place has been announced. If you don’t have a sign, bring a flag to wave, a noisemaker, a bullhorn, or just bring your lungs and stand with the other protesters. Every person counts.